When will be Countryfile Spring Diaries next episode air date? Is Countryfile Spring Diaries renewed or cancelled? Where to countdown Countryfile Spring Diaries air dates? Is Countryfile Spring Diaries worth watching? 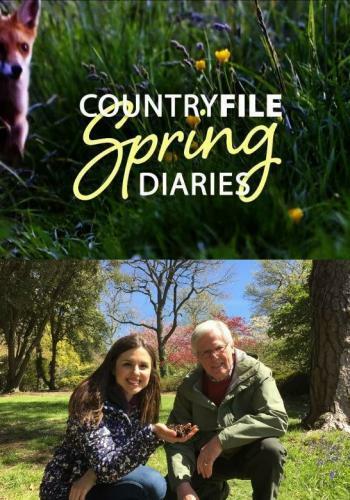 John Craven and the Countryfile Spring Diaries team - Keeley Donovan, Jules Hudson and Margherita Taylor - unveil the secrets of spring. After the dark days of winter, spring is nature's alarm call to bring everything back to life. It seems to come round like clockwork, but is that really so? John and Keeley investigate what makes springtime weather so special. John Craven celebrates the beauty of the Malvern Hills, while Keeley Donovan is in Scotland to investigate how the New Zealand flatworm, an invasive species, is destroying the earthworm population. Keeley gets the lowdown on how to keep them at bay. Paul Martin joins in a spring-clean on a stretch of canal in Birmingham. He discovers how Dhruv Boruah and his extraordinary bike boat are causing quite a splash. Horrified at the haul of rubbish retrieved from the water and the canal side, Paul discovers what harm litter is doing to wildlife and potentially to humans. Margherita Taylor is at Secret World Wildlife Rescue Centre in north Somerset for the first of three special Countryfile Spring Diaries reports. Jules Hudson is at 17th-century Worsbrough Mill in South Yorkshire, where the miller is retiring and the search is on to find a replacement. Matt Baker is out at sea as he joins the RNLI for a high-octane training exercise. John Craven enlists with firefighters in south Wales while Paul Martin discovers that the Rhondda Valley - one of the wettest places in the UK - is braced for around a thousand fires. In Malvern, sheep are nature's fire prevention officers but these animals have vanished from the valleys and the vegetation is running riot. Fire chief Craig knows how to tame the landscape. Paul also meets Becky Davies of Natural Resources Wales and discovers how to safeguard lives and creatures against the worst. Steve Brown's in a Kent garden which needs cat-proofing. Guy Barter, chief adviser to the Royal Horticultural Society has a few tricks but Prof Mark Fellowes, who has studied cats and their territories, reckons Steve could be on to a losing battle. Keeley Donovan is on the shores of Loch Ness finding out about a cutting-edge trial by the ambulance service, where satellite technology could save lives in one of the most remote areas of Britain where patients can be as much as five hours away from the nearest hospital. While John celebrates some of the country's most beautiful villages to visit in springtime, Margherita Taylor's in the Yorkshire Dales in Hudswell. With house prices soaring it's getting harder for villagers to stay in the communities in which they work and have grown up. Hudswell is benefitting from a charitable windfall and Margherita meets a family who it has enabled to stay. In Spennithorne she checks out discounted homes which are helping villagers avoid the property pinch. Jules Hudson is just up the road in Herefordshire with his dog Teddy to sniff out the spring dangers lurking outdoors and in homes which could harm pets. From bluebells to daffodils, reptiles like the adder on the loose and Alabama rot, which can carry a death sentence to dogs from just a roll in the mud, vet Charlotte Watkins warns of the perils and how to avoid them. Paul Martin is at smallholding school in Somerset with two wannabees looking to live the good life. They've already got chickens and will soon be welcoming pigs, but along with Sally Morgan, who runs courses for smallholders, Paul wants Tom and Faith to be braced for the ups and downs. Sally has some hot tips about what to grow to break into burgeoning markets, plus plenty of tips on squabbling hens, rooting pigs and planting, and as Paul knows from having his own smallholding for nearly ten years, it can be a wonderful life-enhancing experience. Countryfile Spring Diaries next episode air date provides TVMaze for you. EpisoDate.com is your TV show guide to Countdown Countryfile Spring Diaries Episode Air Dates and to stay in touch with Countryfile Spring Diaries next episode Air Date and your others favorite TV Shows. Add the shows you like to a "Watchlist" and let the site take it from there.